But I got a rough start. 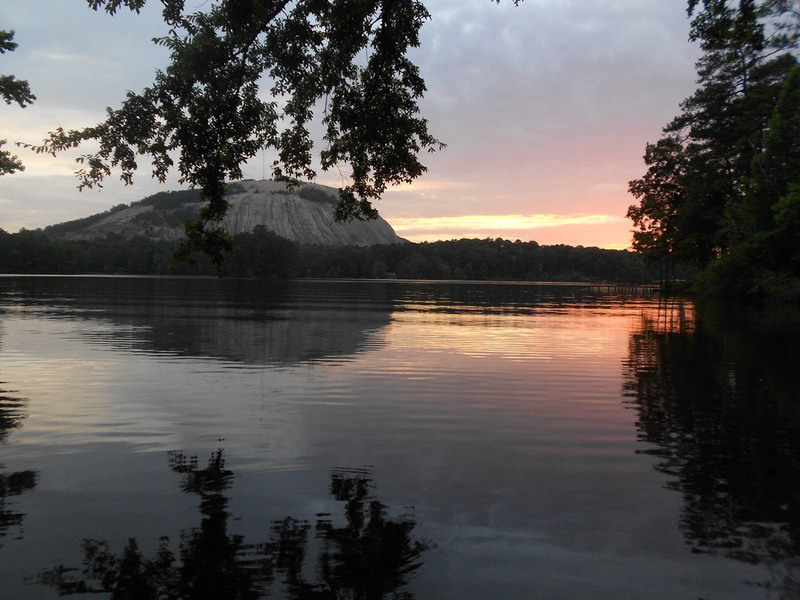 Having visited Stone Mountain several times as an Atlanta resident, I was looking forward to returning to the park to experience the campground. But it just never felt quite right. Between the unsuccessful attempts at trying to get my rig level on horribly pock-marked pavement, to the constant rain, rain, rain, it wore me down. Not just rain, but violent thunderstorms. 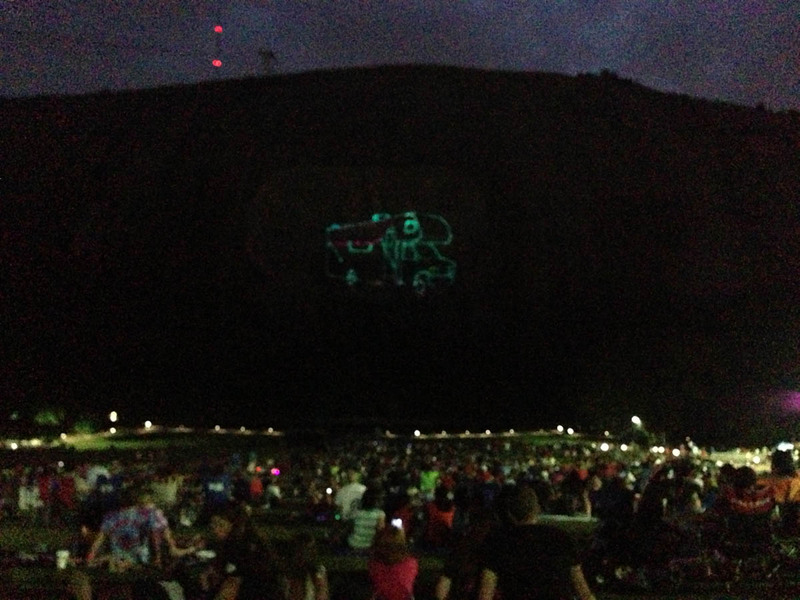 The nightly laser show was eclipsed by Mother Nature’s own version of fireworks dancing over Stone Mountain each night. I was precariously parked in between pine and pecan trees, each hurling their seedlings at me like the angry apple tree in The Wizard of Oz. 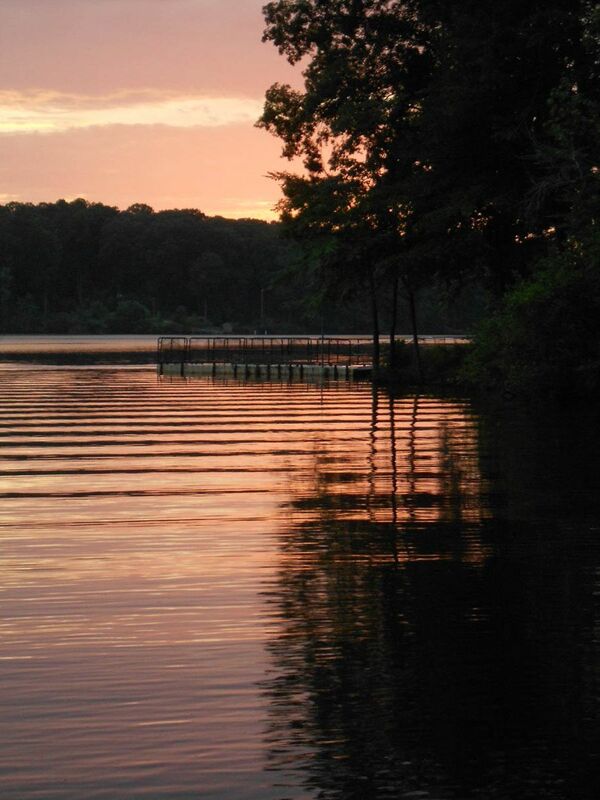 I was looking forward to being on the edge of the lake, having always been a place I wanted to explore by kayak. But when I arrived, I learned water access is forbidden, as are boats of any kind, even inflatables. As close as I would get to the water and its crafty ducks who ate my fancy crackers! 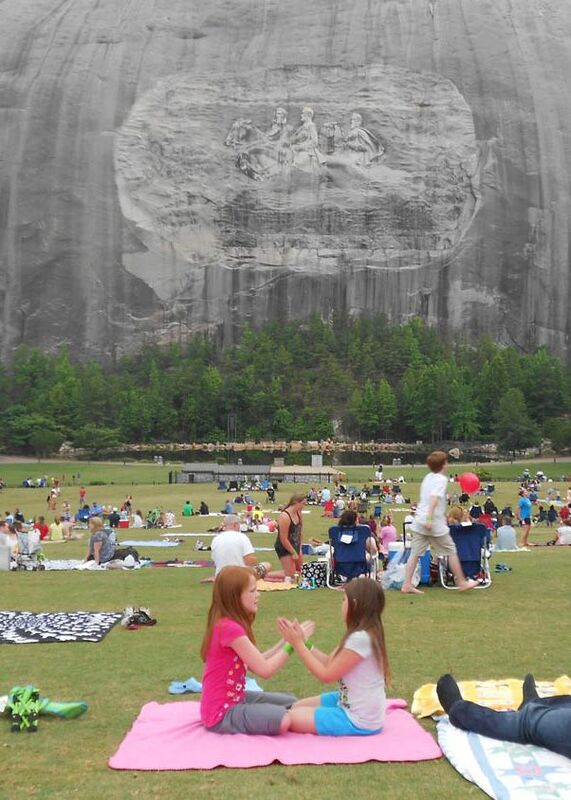 I did enjoy the Stone Mountain lawn-based laser show, though I must confess after living north of the Mason Dixon line for so many years, I winced a couple of times at the “Oh I wish I was in Dixie” soundtrack and all the rebel flags. For perspective, note cable cars overhead and scenic train below. 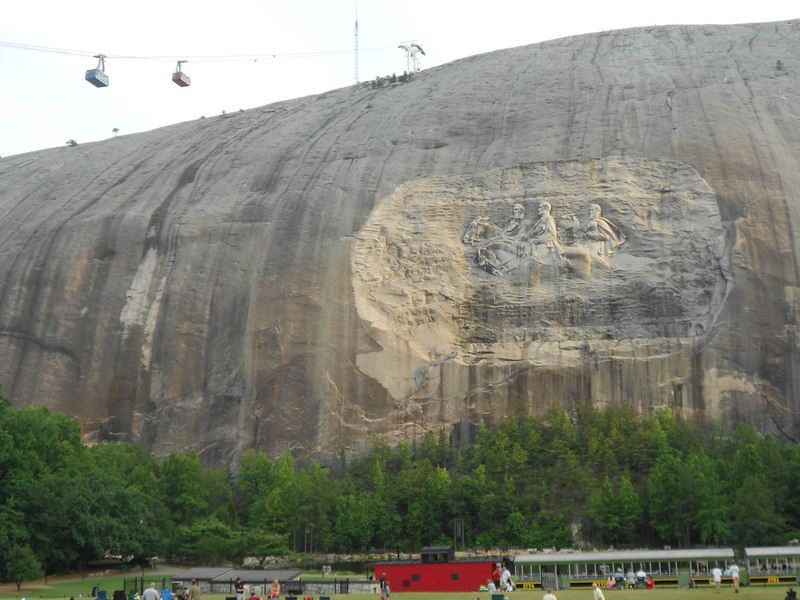 Scenes from the war, as well as noteworthy moments in Georgia’s history are projected onto the stone face, with a soundtrack ranging from Ray Charles with Georgia on his mind, to the chicken in the bread pan picking out dough when the Devil went down to Georgia. It winds up with everyone on their feet during the Star Spangled Banner punctuated by a brief fireworks show. 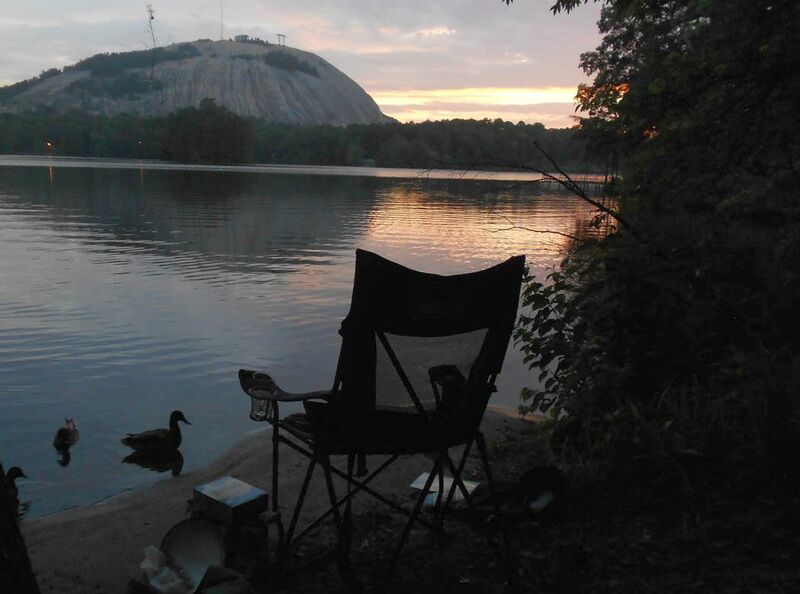 This is a terrible picture taken after dark, but look closely at the face of the mountain, and you will see…ME! In my little Class C! My time here was overshadowed not by my planned “body maintenance” but by “RV maintenance” instead, as I discovered that one of my new $1,000 worth of Michelins and steel valve extensions had sprung a leak after only 3 months. As it turns out, this is a case where I was making something hard out of something easy, and my typical MO of asking everyone I know for their opinion just made it worse. I called Good Sam Roadside Assistance, who was about as helpful as a Google search. They offered to send someone over for a “tire swap” to the tune of a $130 service fee. When I refused, they sent me to a tire company that does not work on dualies. I asked some friends, but one said a valve needed tightening, and he would bring me a tool to show me how, while the other said over-tightening could ruin the valve stem. Since I bought the tires from a Dodge dealer in Texas, I called two local Dodge dealers, neither of them would agree to assist. I asked at the RV Park office, and they gave me a business card for a local tire shop with a number that had been disconnected. I called a local RV place (Peco) down the highway, and they said they could help, but actually had a six week wait! (not kidding!) I was at my wits end. In the end, they pulled through, as they jumped in the car and “borrowed” one from another dealer. The report is it was a leak around the “bead”, but as I still watch the tire pressure drop a pound every time I check it, I am still not completely convinced. I can’t tell if the tire is still leaking, or if I let out a pound of spew each time with my failed attempts to hit the sweet spot with my extended valve pressure gauge. OVER IT! I got my rubber gloves on, got everything hooked up, and gave the black water lever a good YANK to get a good “woosh” going. Much to my horror, it came gushing out around the connection point, splattering all over the pavement! THANK GOD FOR RUBBER GLOVES AND FLIP FLOPS!!! With the dirty job only just initiated, I got the genius idea to take the one off the opposite end. Though a tad too small, it still enabled me to finish without leaving a chemical spill on the asphalt. Thank goodness this dump station was along the roadway, which is the oddest place for a dump station I have ever seen. You literally just park in the two lane alley and dump it. Anyway, I hosed it all down for twenty minutes, then sprayed everything with Lysol, including my feet!!! 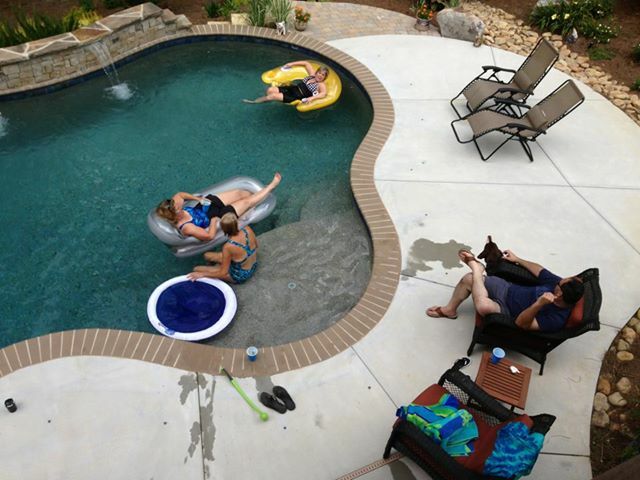 I did manage to have some fun toward the end of my stay in Atlanta, “living like a local.” I got to share a few meals and cocktails with some of my dearest friends, and celebrate their brand new pool…. And experience “The Ghost of Suzanne’s Past” by feeling the flood of relief while driving by the old “sticks and bricks” and reflecting on the fact that I no longer hold the 20+ year mortgage! I came away with clean teeth and a new pair of anti-vanity, progressive “TRI-focals!” Soooo nice to finally be able to read the speed limit signs and the speedometer, both at the same time! And God Bless Amazon.com, as I now have a new portable air compressor and Rhino-flex hose on the way! This entry was posted in Atlanta, Georgia and tagged Confederate Memorial, Good Sam Roadside Assistance, Stone Mountain RV Park by Suzanne. Bookmark the permalink. I saw a Minnie Winnie 2101 DS which I really liked. I hope you don’t have anymore tire issues. Have fun! I love your blog and can’t wait to read more entries. Welcome to Atlanta, and yes, it certainly hasn’t been the best weather here! I’m readying to sell my house and travel in an airstream. I’m sure I’ll learn a lot from your blog and look forward to seeing you on the open road! Thanks for the nice compliment, and for stopping by the blog, Jeff! I think you may learn more “how not to” than “how to” here. haha!! Good luck with the sale of the house…it only takes one buyer! Congratulations on your graduation from “rookie” RVer to “old pro”! One is not able to achieve such worthy distinction until one has a great “black tank dump fiasco” story to share– and yours is a doozy! Thankfully, no expensive shoes were harmed! Glad you were able to get your leaking dually fixed. Safe travels to your next destination! Thanks, Lynne. I think you need to update the “Girl’s Guide to…” on WinnieViews to include a cautionary note, “Be sure to check to see if your O-ring is in place.” LOL!! I enjoyed this post…not just because you got “initiated” with a Black Water fiasco, either (grin). It’s interesting to watch through your eyes/blog… this transformation of lifestyle unfold. It’s as close as we can get to being “pioneers,” without moving to Alaska…which is either too dark or too light…or too cold/wet/buggy. 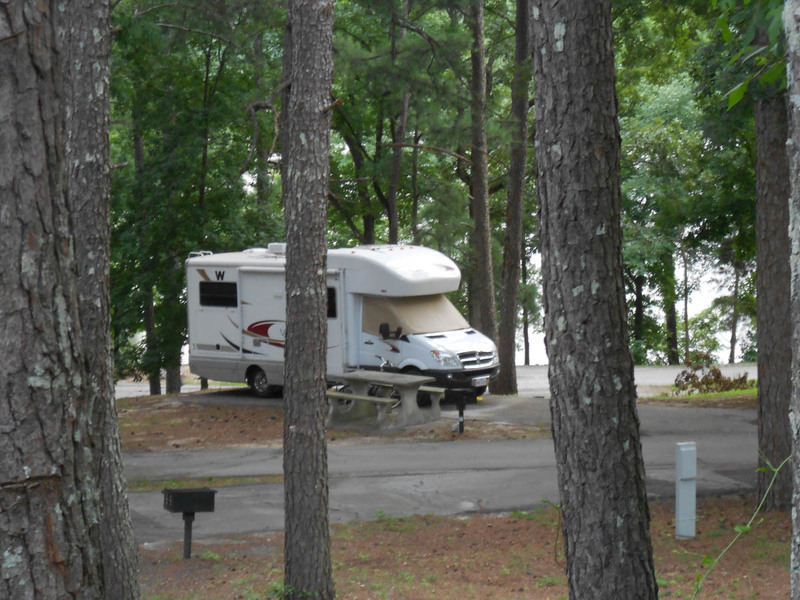 I think reconnecting with old friends is a great way/excuse for RV travel, especially those with swimming pools in their back yard 🙂 And then there is making new friends, so be sure to stop by when you turn westward. I give you a free pass to the Ouray Hot Springs pool. You’re making my checklist longer and longer for when I buy my classA. But now that my roommateI MIA I might get a vlass B instead or a C.